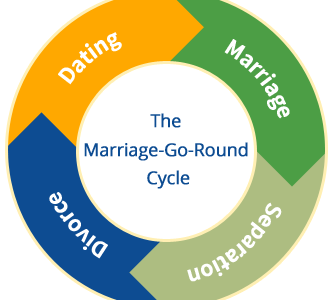 Remarriage within a year after separation generally ends just as the previous marriage— in divorce. What leads someone to make such an impulsive decision after living through the sobering ordeal of divorce? Well, there are lot factors driving a person to make such an unconsidered action. Many want to escape the unexpected loneliness of being single. Often it includes isolation from former friends and exclusion from familiar social gatherings. Sometimes the overwhelming burden of single parenting partner again so soon. Or, after squandering precious years I of marital unhappiness the person may want to may want to make up for lost time… If the new partner was the extramarital partner in an ongoing affair, the person may want him or her to make good on an earlier promise of marriage. The need to get on with one’s life is surely understandable, as is the feeling of elation that accompanies the state of being “in love” again after years of numbing conflict or deadly indifference. Unfortunately, this state of exhilaration may not lead to the best choice for a new marital partner, as seen so clearly once the initial headiness of romance has worn off. Although not wrong in itself, the person may bring a blind eye to or otherwise minimize potential problems along the way. Is the Rest of the Family Ready? Relationships entered into soon after separation are apt to compensate for previous deficits in the marriage. Even if the new partner is an old acquaintance, and the connection appears solid, the decision to remarry so soon after divorce may create hardship for friends and family. Parents and children are still getting used to the loss of the former family. They may find it difficult to embrace the new spouse wholeheartedly. So, they may resent and respond more antagonistically toward the new partner than if they had a longer grace period. If the new couple can be sensitive to the emotional needs of other family members at this time, they may enjoy more support for them over the long term.